Darfur United is one of 12 teams playing at the ConIFA World Cup. 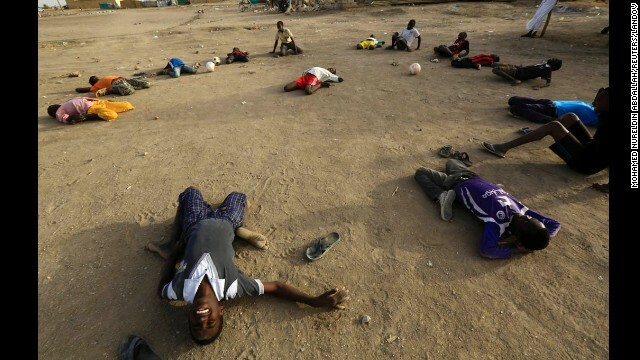 Here the players train in one of the East Chad refugee camps set up after the conflict in Sudan. The team training has emphasized fitness and discipline ahead of the tournament in Sweden. 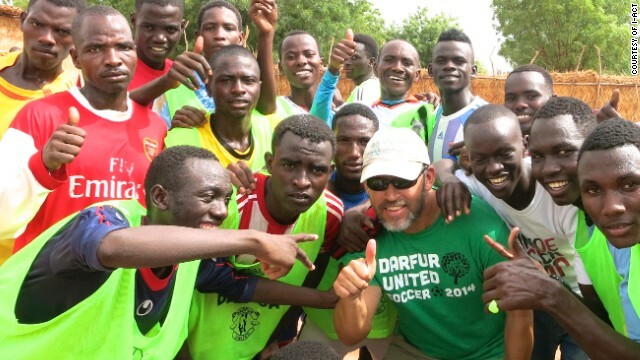 The Darfur players pose with i-ACT founder and executive director Gabriel Stauring ahead of the trip to Ostersund. Mahamat Oumar Ignegui, known as "Iggy," plays midfield and is among the leaders of the team. 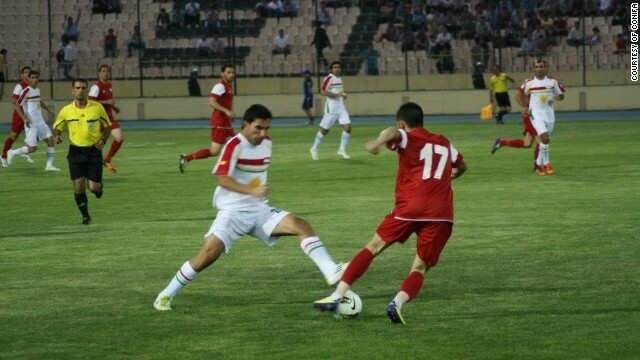 Iraqi Kurdistan took on Cyprus in the 2012 Viva World Cup final in Kurdistan -- the hosts won 2-1. 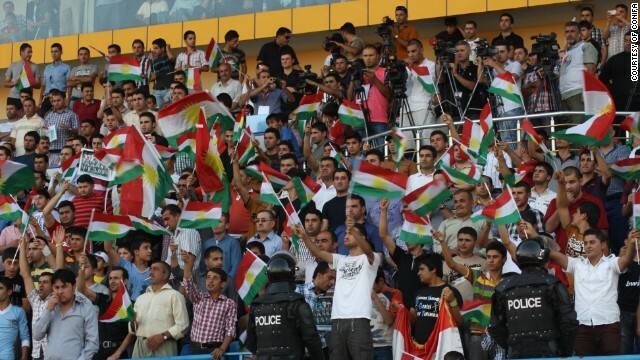 Kurdistan fans were out in force to support their team at the 2012 tournament -- there are over 40 million stateless Kurds in the world today. Enock Barwuah -- brother of Italy and Milan forward Mario Balotelli -- and ConIFA Europe director Alberto Rischio (left) in Ostersund. (CNN) -- Ahead of the biggest game of his life, Mahamat "Iggy" Ignegui has mastered the diplomatic language, if not his nerves. "I am completely focused on the first match. We have to do it, we cannot lose," the Sudanese midfielder tells CNN before boarding a plane from Chad's Ndjamena airport that will continue his remarkable journey to the World Cup. This showpiece event will not feature Cristiano Ronaldo, Lionel Messi, or any of the other household football names that will light up Brazil this summer. Instead, teams such as South Ossetia, Iraqi Kurdistan and Tamil Sri Lanka will do battle for the Nelson Mandela trophy in Sweden. This is a tournament for the stateless, the marginalized and unrecognized by FIFA -- the ConIFA World Cup. Students take notes during an English language class at the Juba Nabari Primary School in Juba, South Sudan, on Wednesday, April 9. Recent conflict in the country has made resources scarce; many civil servants, including teachers, have not received their pay for several months. South Sudan erupted in violence on December 15 when rebels loyal to ousted Vice President Riek Machar tried to stage a coup. Violence quickly spread, with reports of mass killings emerging nationwide. 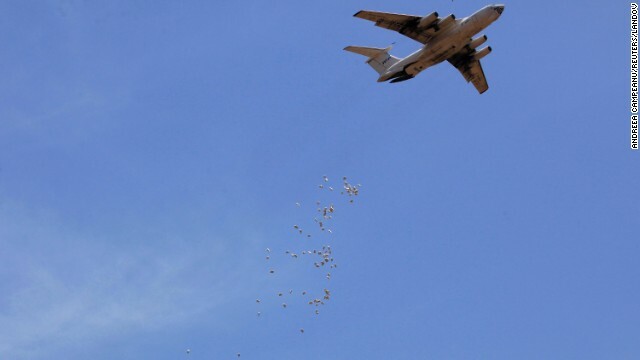 Bags of food are dropped from a plane during a World Food Program operation Tuesday, April 1, in Nyal, South Sudan. 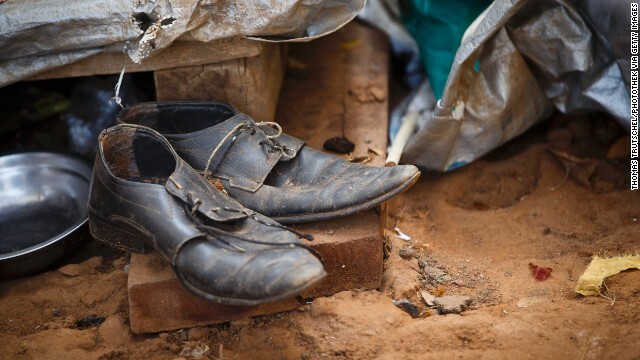 Worn-out shoes are seen in an internally displaced persons camp Thursday, March 27, in Juba. 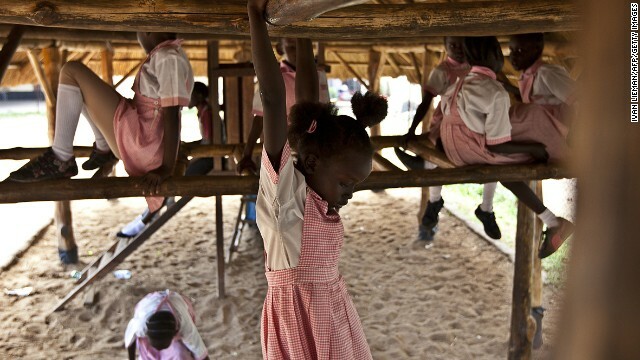 Students play Tuesday, March 25, at the Dr. John Garang International School in Juba. 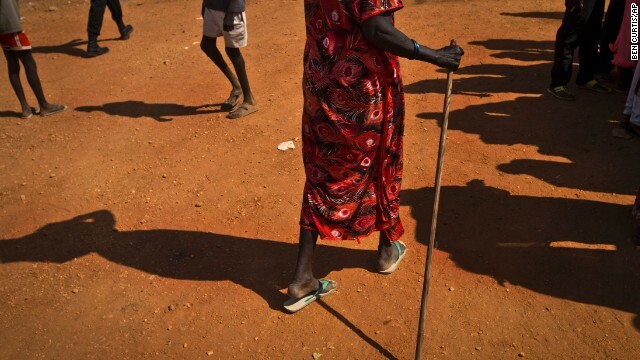 A man carries a bag on his shoulder at a camp in Malakal, South Sudan, on Wednesday, March 19. 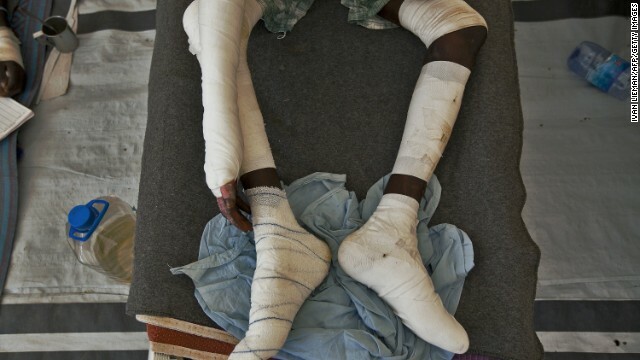 A man recovers from serious injuries, which he sustained in clashes between government forces and rebels, at a Doctors Without Borders hospital in Malakal on Tuesday, March 18. 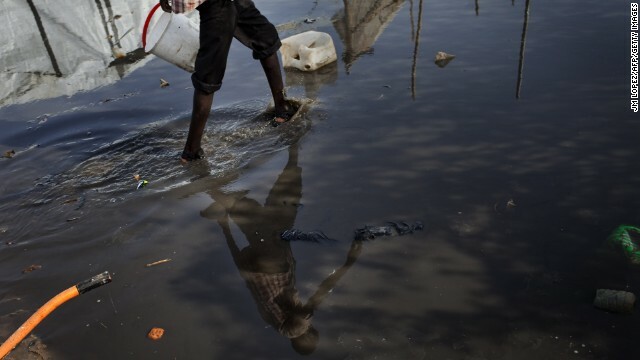 A South Sudanese man walks in a puddle Saturday, March 15, at a camp for internally displaced people. Displaced children from South Sudan gather to play soccer at a camp in Khartoum, Sudan, on Wednesday, March 12. 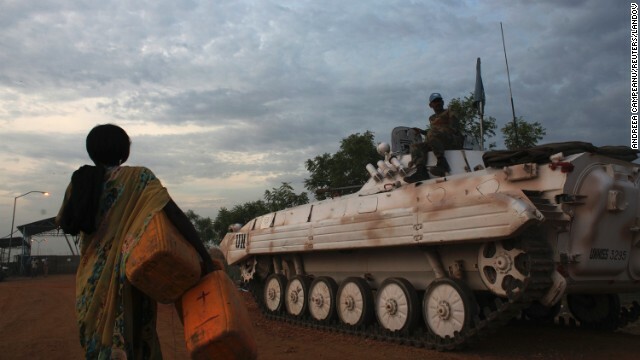 A woman carrying empty cans for water passes an armored vehicle affiliated with the United Nations mission in Malakal on Monday, March 3. 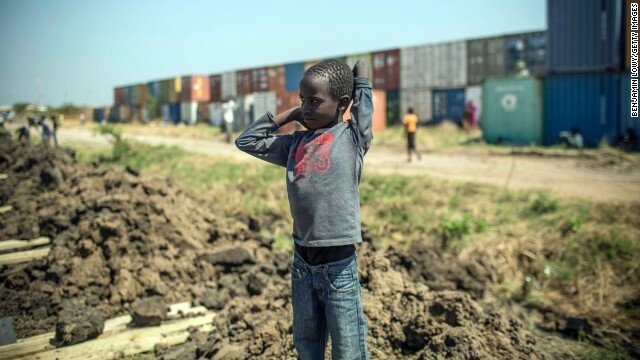 An 8-year-old boy waits in a car during Petroleum Minister Stephen Dhieu Dau's visit to an oil production facility in Paloch, South Sudan, on Sunday, March 2. The boy's father, a member of the Sudan People's Liberation Army, said his son was dressed like a pilot because that's what he wants to be when he grows up. 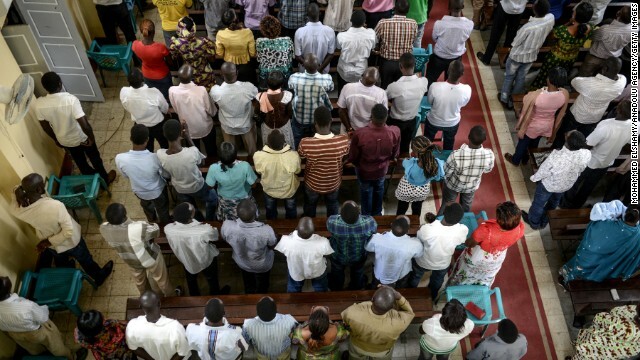 Catholics pray for peace during a religious ceremony in Juba on Sunday, February 23. 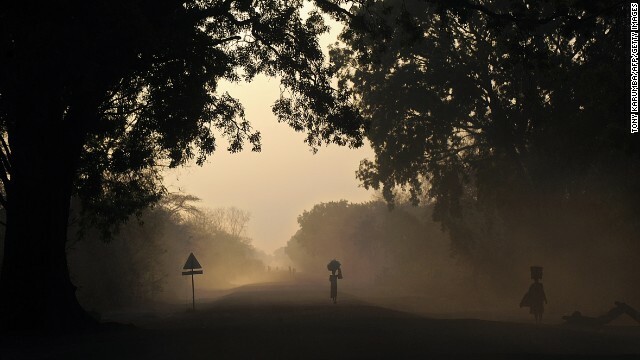 People are silhouetted at dawn on Thursday, February 20, as they walk on the main road to Cueibet, South Sudan. An inmate sits shackled to a tree Wednesday, February 19, in the courtyard of the central prison in Rumbek, South Sudan. 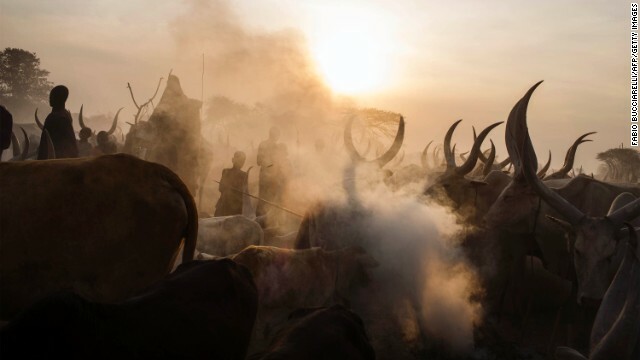 South Sudanese people from the Dinka ethnic group stand among cattle at a cattle camp in Yirol, South Sudan, on Wednesday, February 12. 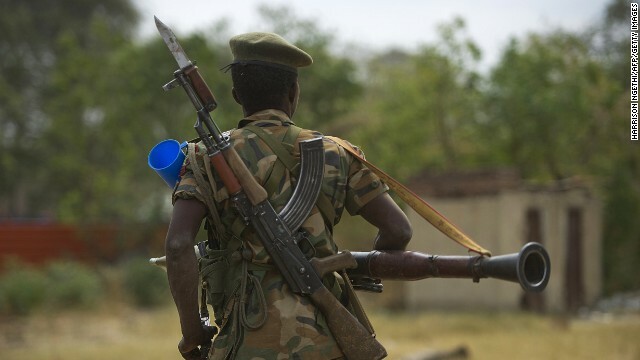 A South Sudanese People's Liberation Army soldier patrols in Malakal on Tuesday, January 21. 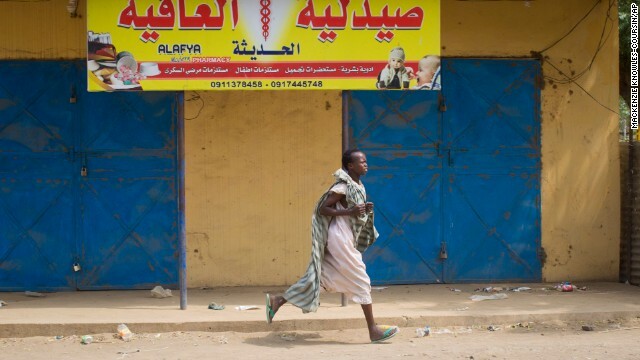 A woman runs through the street in Malakal as gunshots ring out a few streets over on January 21. 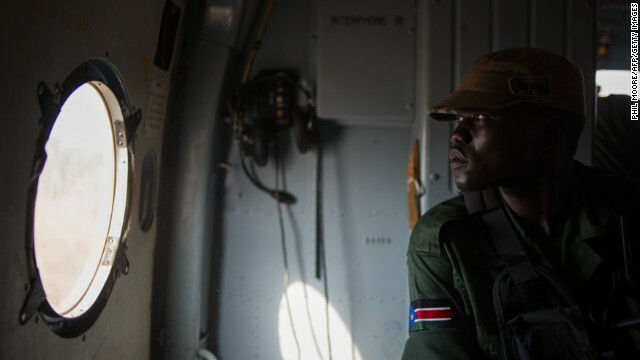 A Sudan People's Liberation Army soldier sits in a helicopter flying over Western Equatoria State on Tuesday, January 14. 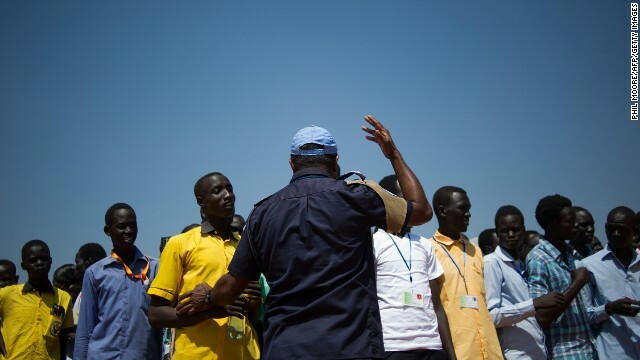 A United Nations peacekeeper gestures as South Sudanese students wait to walk back to a camp for internally displaced people after taking an English exam at a United Nations base in Juba on Monday, January 13. Government soldiers prepare to deploy from Juba on January 13 as fighting continues to rage in South Sudan. 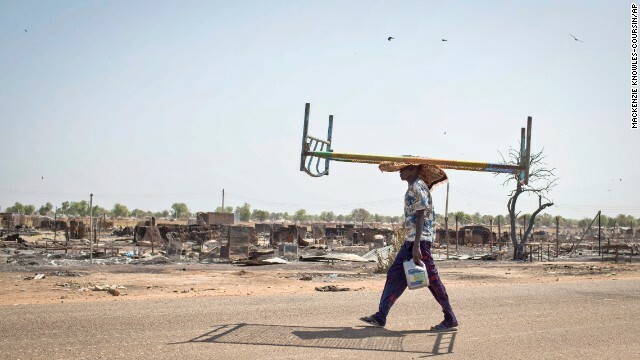 A young man balances a bed on his head as he walks through empty streets and destroyed buildings after government forces retook from rebel forces the provincial capital of Bentiu, in Unity State, South Sudan, on Sunday, January 12. 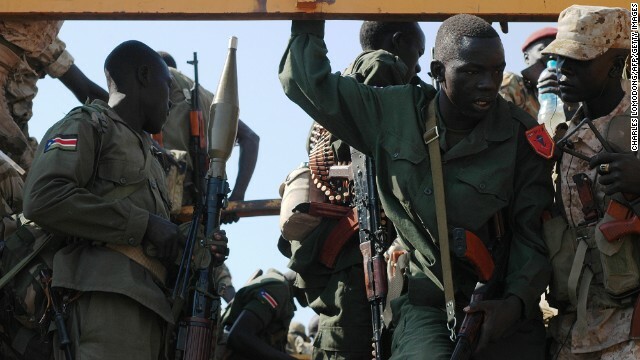 South Sudanese government forces riding on a vehicle through a still-smoldering town pass a boy after government forces retook the provincial capital of Bentiu on January 12. 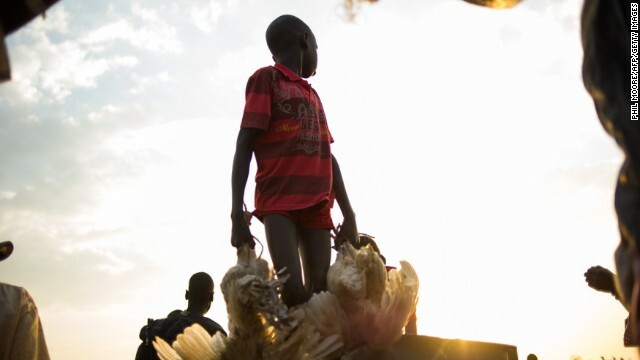 A boy carries chickens off a boat arriving in the village of Minkammen in Awerial county, South Sudan, on Saturday, January 11. 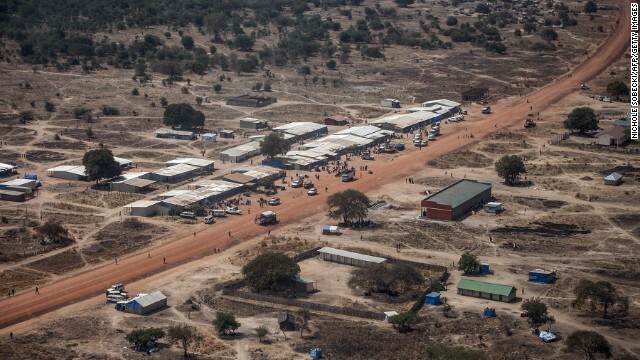 A picture shows an aerial view of a camp of internally displaced people in Minkammen, on Friday, January 10. 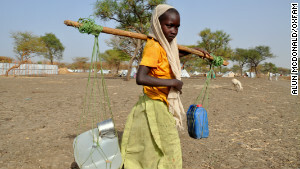 Internally displaced children carry water in Minkammen on January 10. A woman covers her face as a U.N. helicopter takes off from Minkammen, where people receive food aid and other items from a recent International Committee of the Red Cross on Wednesday, January 8. 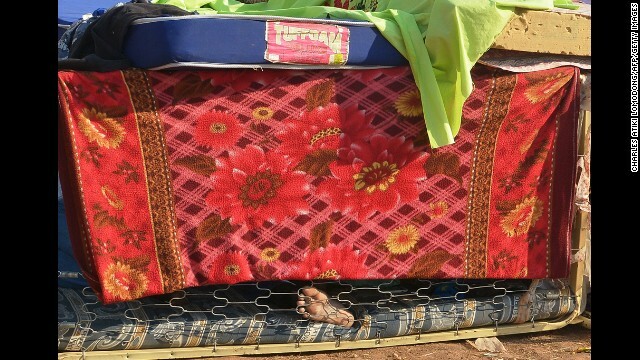 A displaced south Sudanese sleeps in a makeshift shelter at a crowded encampment within the United Nations Mission in South Sudan on Saturday, January 4. 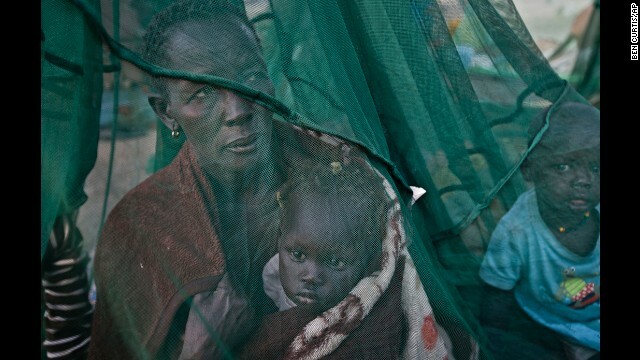 One of the few to have a mosquito net, a displaced family who fled the recent fighting between government and rebel forces in Bor by boat across the White Nile, sit under it in Awerial, South Sudan, on Thursday, January. 2. 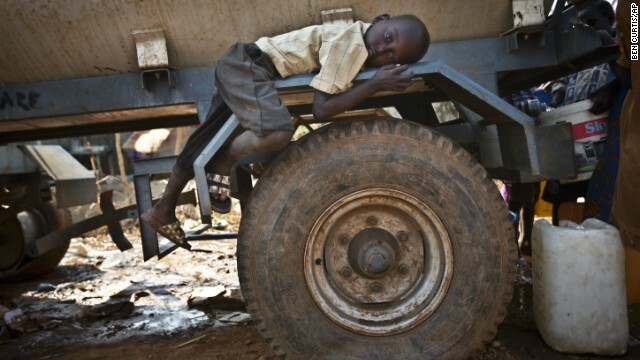 A boy rests on the fender of a water truck Tuesday, December 31, at a United Nations compound on the outskirts of Juba, South Sudan. 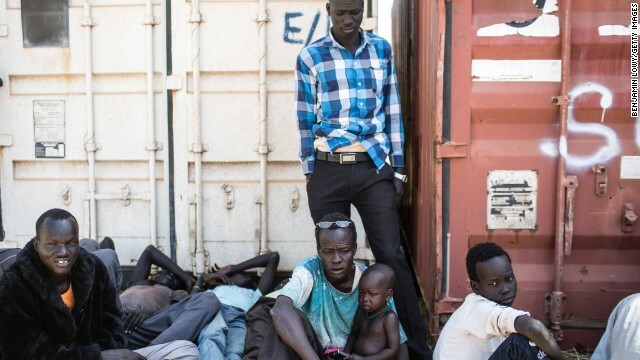 The compound has become home to thousands fleeing the recent fighting in South Sudan. 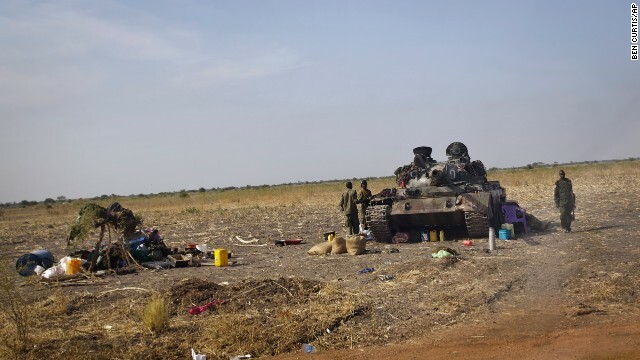 South Sudanese government soldiers man a tank near the airport in Malakal, South Sudan, on Monday, December 30. 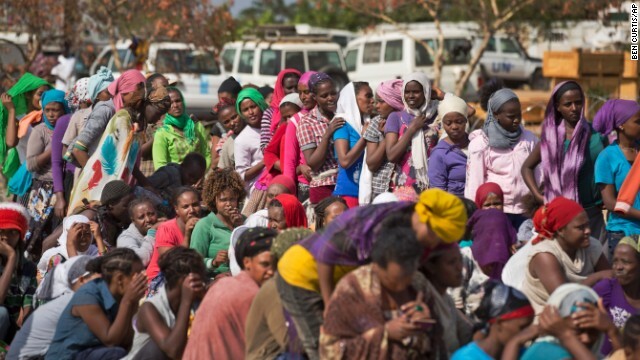 Displaced women wait in line inside a U.N. camp in Malakal on December 30. 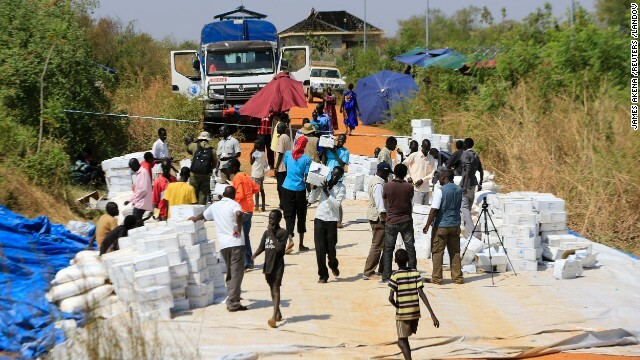 South Sudanese refugees carry relief supplies an a U.N. camp in Juba on Sunday, December 29. 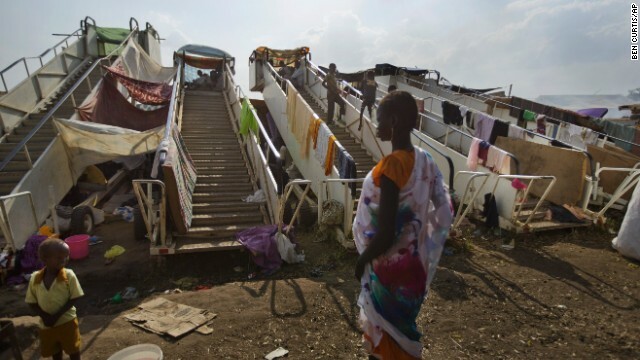 Moveable stairs used for passengers to board aircraft are repurposed into makeshift shelters at a U.N. compound in Juba on December 29. 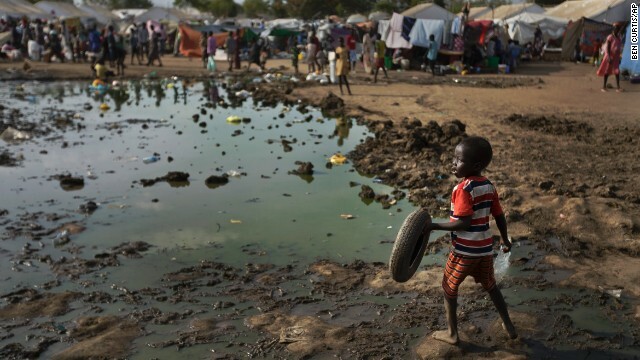 A child plays with a tire next to a large puddle of muddy water inside the U.N. compound in Juba on December 29. 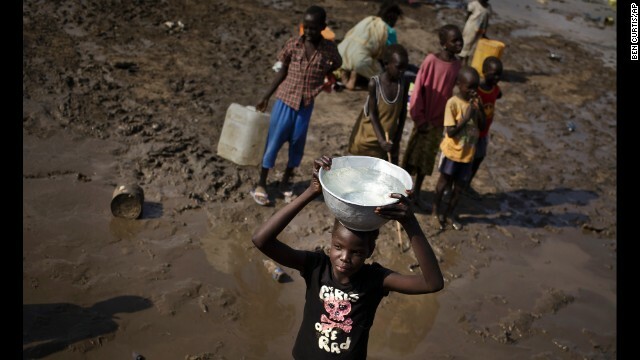 A girl carries a bowl of water after filling it from a truck at the U.N. compound in Juba on December 29. 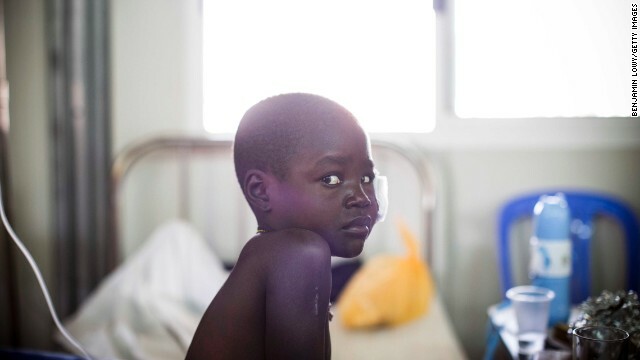 A man walks in a ward where most patients are soldiers with gunshot wounds inside the Juba Military Hospital in Juba on Saturday, December 28. 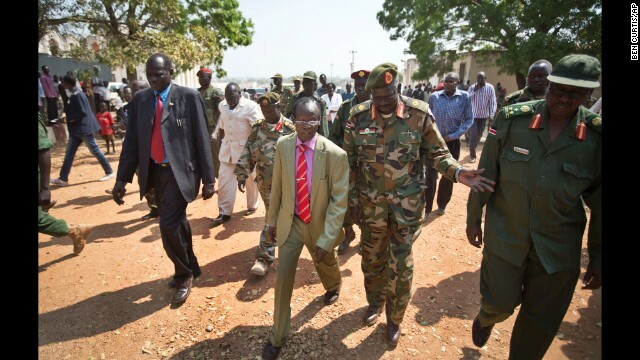 South Sudan Vice President James Wani Igga, center left, arrives to visit patients at the Juba Military Hospital on December 28. 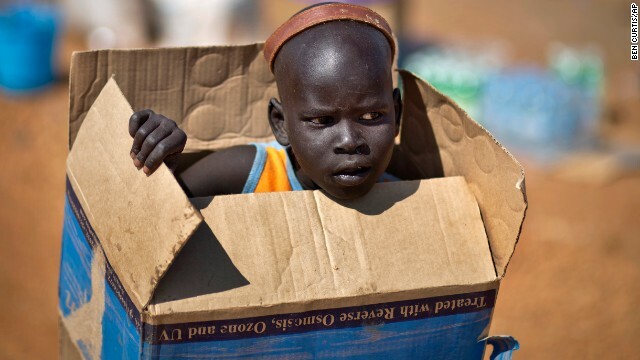 A displaced boy carries a cardboard box inside a U.N. compound in Juba on Friday, December 27. 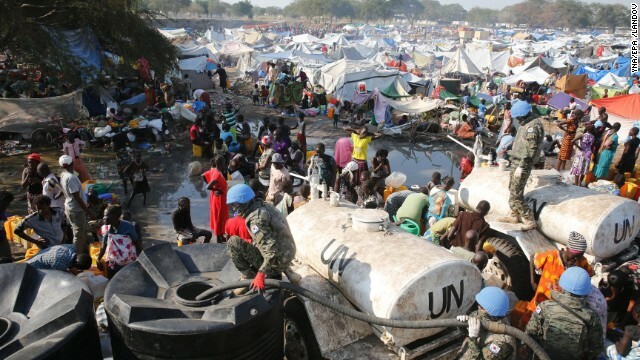 Displaced people bathe and wash clothes in a stream in a U.N. compound in Juba on December 27. A woman carries items on her head through the U.N. compound in Juba on December 27. 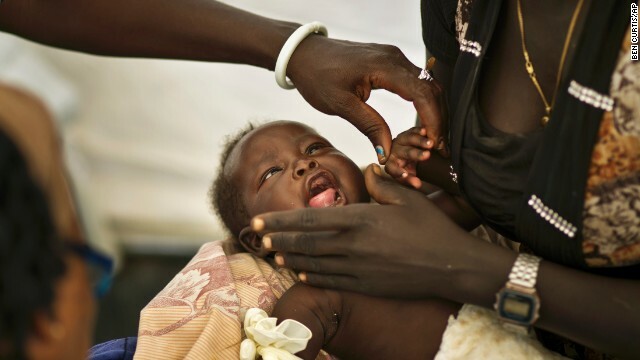 One-month-old Nhial Hoan Malual receives treatment for dehydration and chest pains in a medical tent run by Doctors Without Borders at the U.N. compound in Juba on December 27. 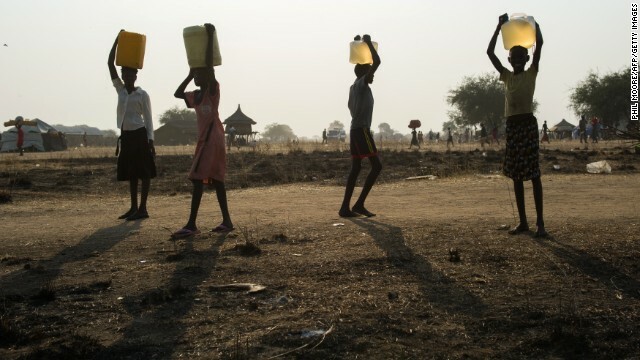 South Korean soldiers provide water at a refugee camp in South Sudan on Thursday, December 26. Hundreds of South Korean soldiers are stationed in the town of Bor as part of United Nations peacekeeping forces. 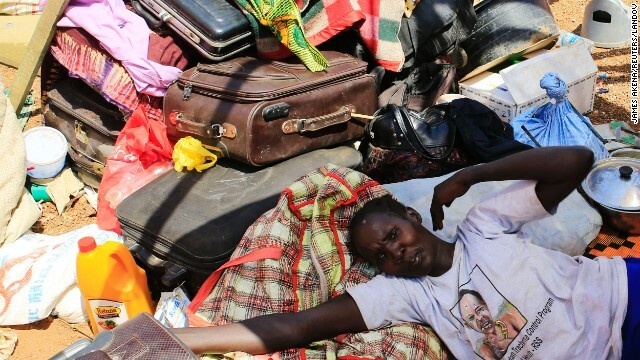 A mother displaced by recent fighting in South Sudan rests on top of her belongings in a makeshift U.N. shelter on Monday, December 23. 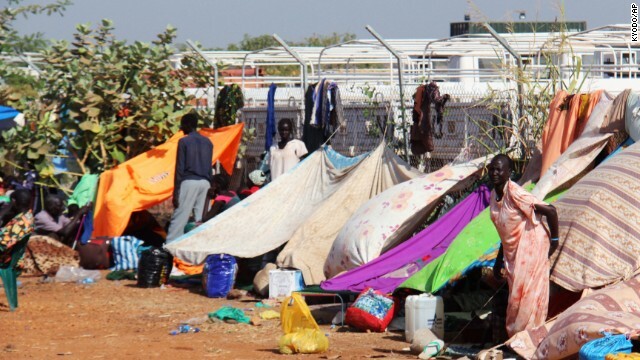 Families seek refuge in U.N. camp warehouse on December 23. 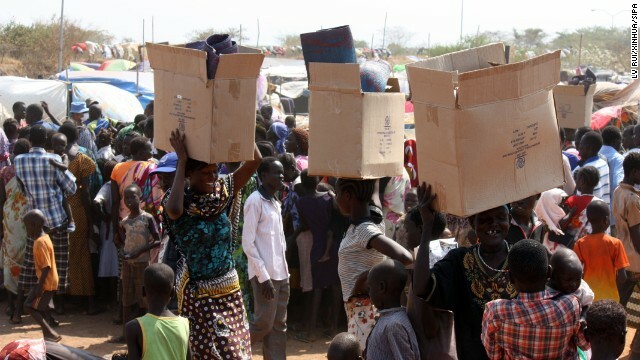 People gather to receive emergency food rations from the World Food Programme at a makeshift camp on December 23. 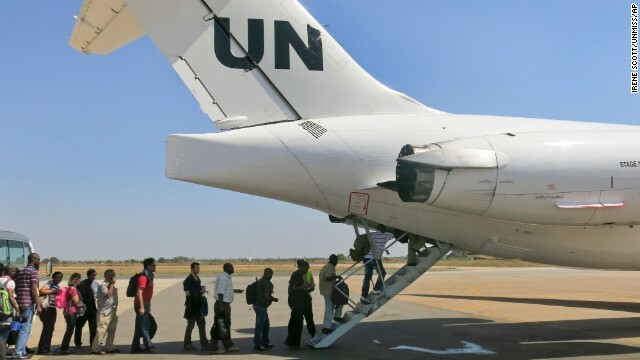 The United Nations relocates noncritical staff from Juba to Entebbe, Uganda, on Sunday, December 22. 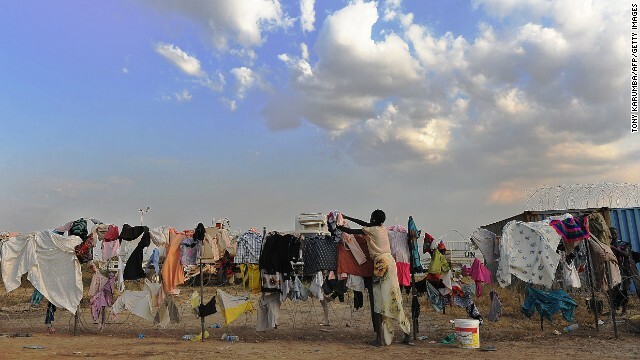 A South Sudanese girl puts her family's laundry out to dry on a barbed-wire fence at a makeshift U.N. camp in Juba on December 22. 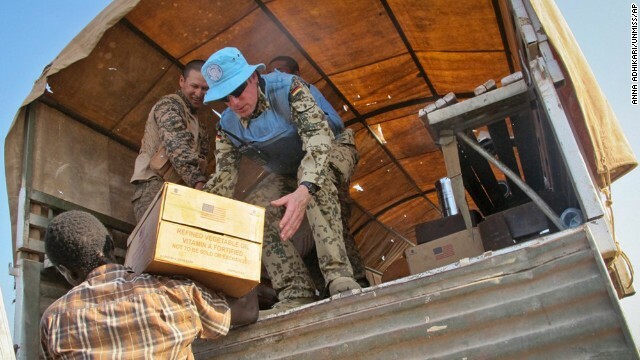 The World Food Programme distributes food for displaced people at a U.N. compound in Bentiu, the capital of the oil-producing Unity state, on December 22. 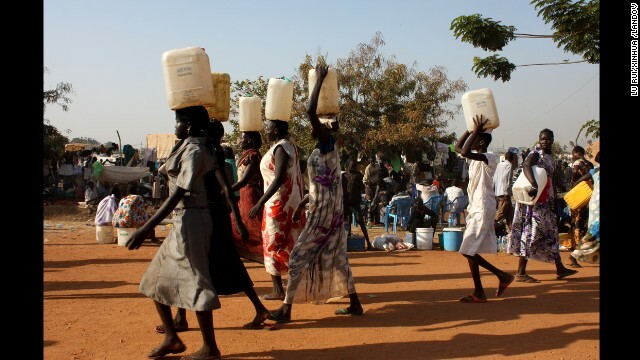 South Sudanese women carry water at a U.N. camp in Juba on December 22. People take refuge December 22 near a camp of Japan's Ground Self-Defense Force, which is part of the U.N. peacekeeping mission in Juba. 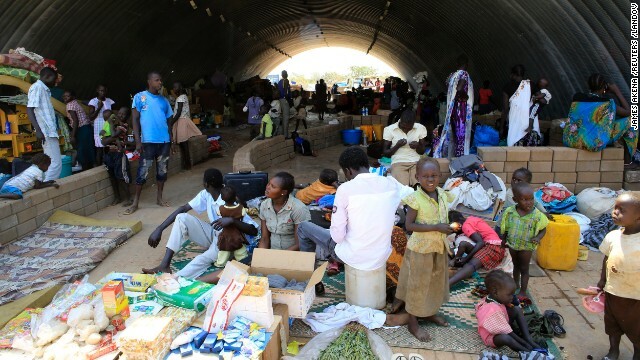 South Sudanese civilians take shelter at a U.N. mission on Tuesday, December 17. 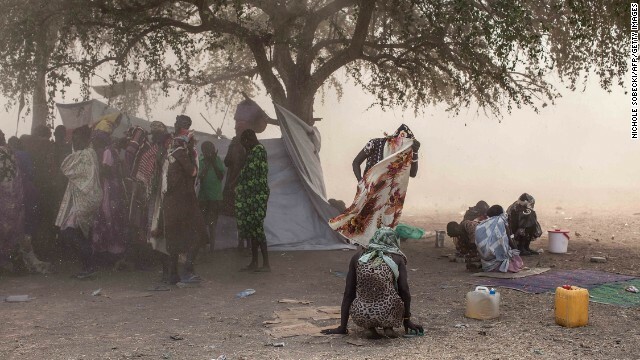 South Sudanese civilians seek shade at the mission's base on December 17. 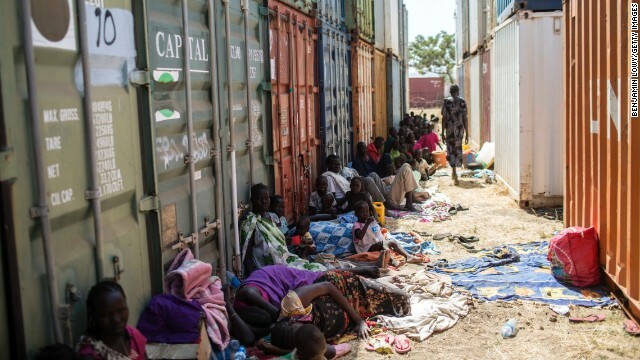 Tens of thousands of civilians have taken refuge in U.N. bases in South Sudan. These civilians were photographed at one of the bases December 17. A young child takes shelter at a U.N. base on December 17. 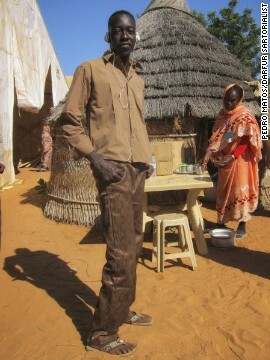 The Darfur Sartorialist is a project designed to showcase to the world the fashionable people of Sudan. 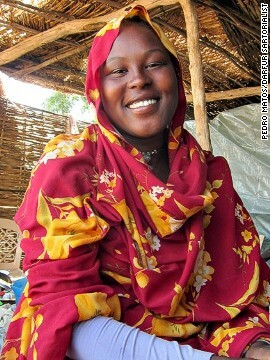 It was created by Portuguese aid worker Pedro Matos, who lived in Darfur for three and a half years. 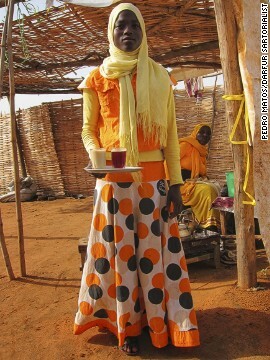 Upon arriving in Darfur to work for a United Nations agency, Matos was surprised to see the bold color combinations worn by people in the region. "I was blown away by what I saw," says Matos, a former urban planning engineer. "The way people interacted was not what I was expecting and that's when I started taking photographs." The traditional Sudanese clothing is the toub -- many meters of cloth that's wrapped around the body and head. "Their undergarment would often be a patterned shirt and trousers, and with the toub, combinations are extremely varied," says Matos. Matos says that local fashion is also influenced by the Sudanese diaspora and the soap operas from the Middle East "where women often dress a bit more Westernized." "The variety is something that surprised me," says Matos. "In the West we often have these fashionable dark colors and because there are all these franchise stores, you get to see people dressed pretty much in the same way. 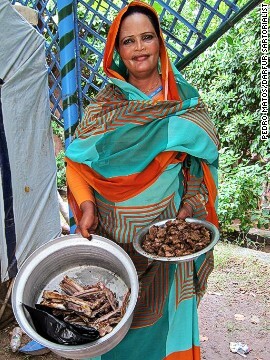 But in Sudan, they're so varied." 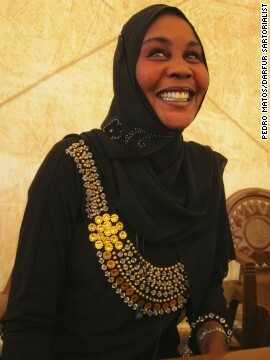 Matos, who is not a professional photographer, has done so far three exhibitions of the images he took in Darfur. 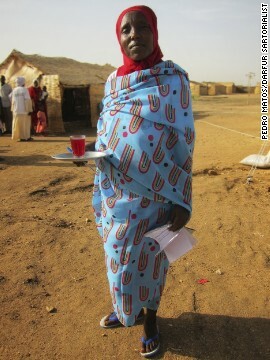 He describes the way women in Darfur dress as "colorful, unique, proud and fashionable." 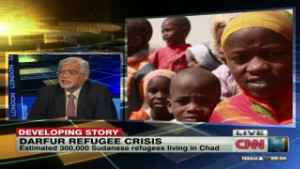 "Most people in the West are extremely surprised and most people in Sudan are quite happy that someone is covering Sudan in such way, with many smiles, and proud, fashionable people," says Matos. His projects also includes photos of men in Darfur. "Men dress much more bluntly," says Matos. 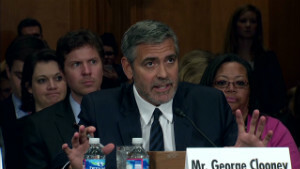 "It's a world phenomenon," he adds. "[The pictures are] often more about their expression and their movement, than the clothing itself." No team has traveled further or struggled harder to make it to Ostersund than Darfur United. The squad is entirely made up of refugees from the conflict that claimed over 200,000 lives, now living in the neglected camps of East Chad. 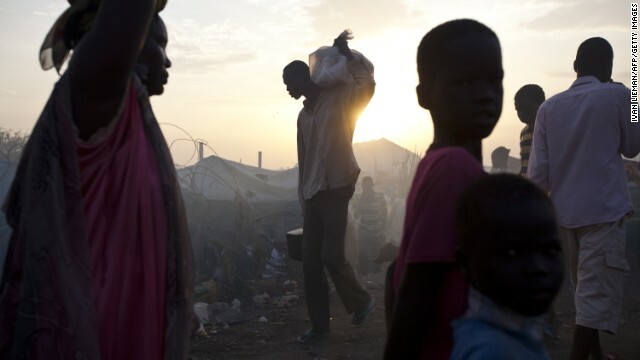 Eleven years on from the conflict, foreign aid and interest has dried up, with rations cut in half and the UN Refugee Agency (UNHCR) reporting over 50% prevalence of chronic malnutrition in the camps. 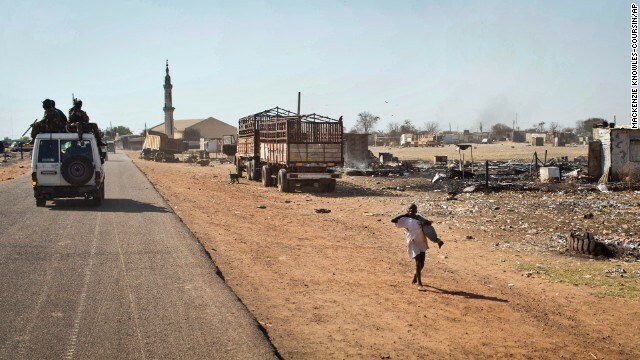 "Life in the camps is better than Sudan now," says Ignegui, recalling that in his village even the sheep were killed and every house was destroyed. "But they destroy youth. We need to improve our skills and go to university. But there are no good schools or hospitals, nothing to do. We need to get out." Football is providing that release. The camps had always played the game, with cloth balls in the scorching heat, but with the support of U.S.-based humanitarian group i-ACT, a new team was formed in 2012. Thousands of hopefuls from 12 camps participated in tryouts, many traveling for days at their own expense. This was whittled down to a squad of 16 players, who traveled to Iraq for the 2012 Viva World Cup just months after forming, and played their first match in a 15-0 defeat to Northern Cyprus, before Moubarak Haggar Dougom scored their first goal in a 5-1 loss to Western Sahara. 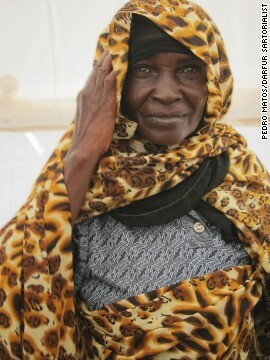 The Darfur conflict began in 2003. 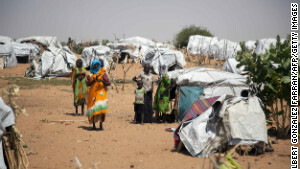 The U.N. estimates that by 2008, 300,000 people had been killed, and more than 3 million displaced. 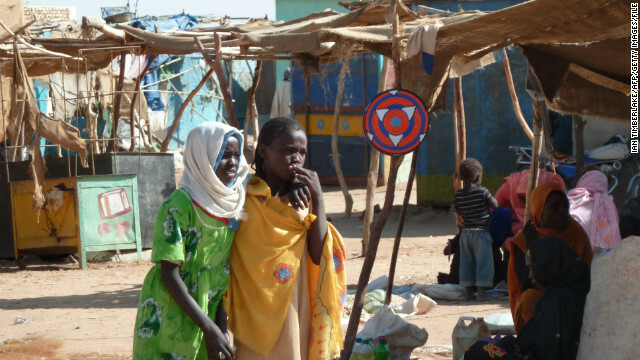 Pictured, two girls in the Abushouk camp for internally displaced persons, in North Darfur, in January 2012. 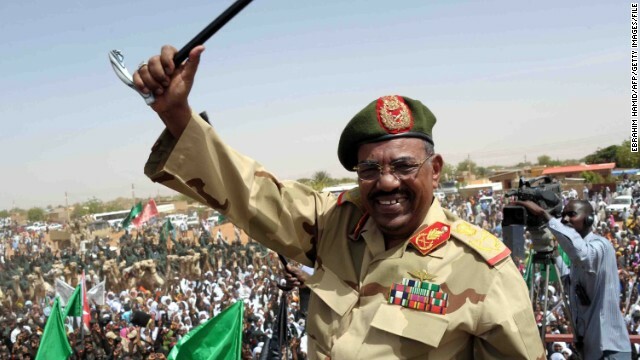 In 2008 the International Criminal Court filed genocide charges against Sudan President Omar al-Bashir for his role in the campaign of violence in the Darfur region. 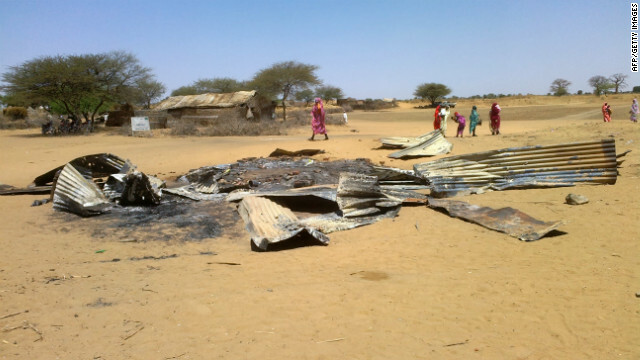 There has been a recent upsurge in state-sponsored violence there, according to the U.N. Pictured, the remains of a house in Derib al Reih village, South Darfur, that was reportedly destroyed by the Sudanese air force in February 22, 2013. Organizations including the Darfur Union and Waging Peace are launching the "Darfur10" campaign to put the war-torn region back onto the international agenda. 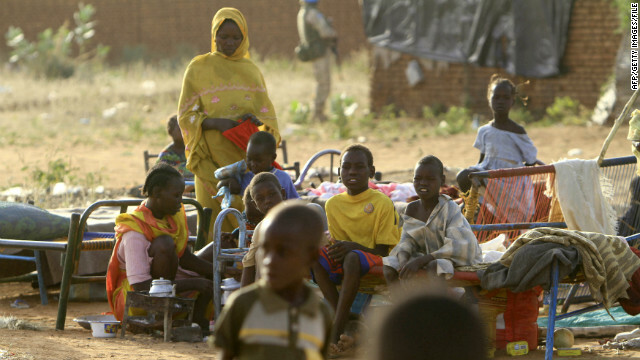 Pictured, children at the Kalma Internally Displaced Persons camp, in November 2010. Ignegui admits that team-building was a challenge at first. "We were from five different tribes, all with their own language, so nobody understood each other and everybody was fighting," the 25-year-old says. "But after 10 days of training together we changed our behavior to respect each other, and became like brothers." That spirit gave rise to their name. 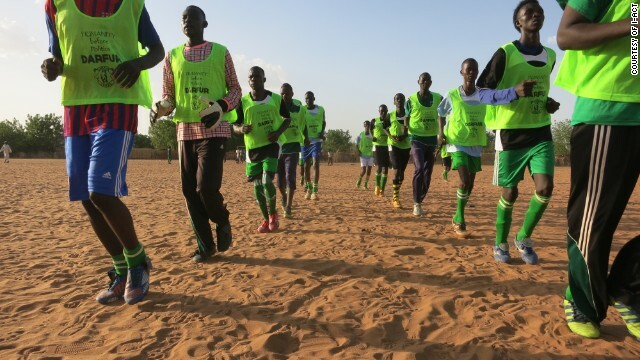 While the children of the camps wear the shirts of Real Madrid and Barcelona, Darfur United borrowed its badge from Manchester. Two years on, the team has benefited from regular training under professional coach Mark Hodson. 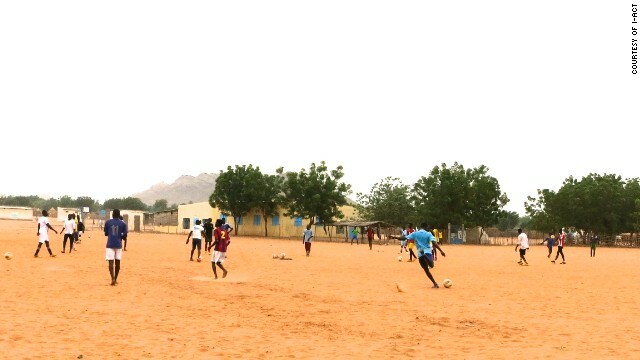 Participation has grown, with 900 girls and boys playing at the new Soccer Academy in Djabal Camp, and several more are planned, while a women's team will be launched next year. But despite such development, the team's attendance in Ostersund was always in the balance. "Everything came down to the wire," says Katie-Jay Scott Stauring, i-ACT's director of operations and community involvement. "We had a 72-hour fundraising drive to raise $1,850 per player and coach. 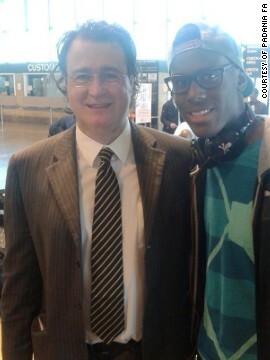 We made it in time with six minutes to the deadline to pay for the team's airline tickets." The stress did not stop there, with delays for visas again threatening their participation, as well as diplomatic complications between embassies, before the team was finally allowed to travel. That Darfur United's players will be lining up in Sweden is a reflection of the international goodwill and support behind them. From the volunteer coaches and assistants, to donations received from football fans around the world. NBA basketball star Tracy McGrady contributed the team's kits, and a printing house supplied the logos free of charge, while Turkish Airlines bent its rules for travel requirements. The team will have a difficult assignment in Sunday's opening match against tournament favorite Padania, of the Po' Valley region in northern Italy. While the area was associated with the far-right Lega Nord party, the team now promotes an inclusive message, represented by star player Enock Barwuah -- brother of Italy international Mario Balotelli, who will line up at Brazil 2014. "It's the first time I play for Padania and I said yes straight away," says Barwuah. "I was born here, and lived here, so I feel a connection. It's a great experience to play with teams from around the world." Barwuah admits he knows little about his first opponents, but is keen to learn more. There are two main purposes to the tournament, says ConIFA president and former referee Per Anders Blind. "We work to support ethnicities and isolated regions, and also to educate the world about them, to know they exist and who they are. To show their culture, heritage and traditions." This is the largest tournament to date for stateless peoples -- replacing the poorly organized Viva events -- with a record 12 teams, and Blind sees limitless potential. "There are 5,500 ethnicities and regions that cannot play. FIFA have 209 members and we can easily double that," he says. "ConIFA is only 10 months old and members say we have accomplished more than Viva did in 10 years. Sponsors realize we are opening up a whole new market. There are 40 million Kurdish people without a state, for example." The knockout rounds are expected to sell out in the admittedly modest 6,000-capacity stadiums, and there is evidence of growing public interest in the outposts of football, away from the traditional powerhouses of the game. The story of American Samoa, the world's worst international team, has generated a hit book and film. "There are so many teams who fall outside the FIFA framework and it's very valuable to give them recognition," says Paul Watson, an English football journalist who managed Pacific Island Pohnpei, and now Mongolia. "The ConIFA competition will give a lot of people a chance to express their identity through football and that's a very valuable thing." For Ignegui, it is priceless. "Football has bought joy to a group that has not had good news in a long time. People in our camps are so proud and happy with this team when they see us representing them in the tournament," he says. "It has made a lot of difference to our lives. After 11 years in our small tents, something like this seemed impossible, just a dream." 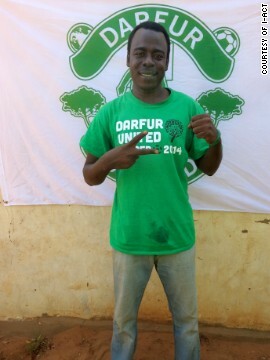 Although Darfur United's players are desperate to bring the trophy home, perhaps their most important battle has already been won.